First, sincere wishes of safety for anyone in the path of Hurricane Florence. Being from New Orleans and having so many family members and friends affected by Katrina (and other storms), if you are reading this in a coastal Carolina (or Georgia) area, please heed authorities especially if they suggest or mandate an evacuation. The pending landfall of a major hurricane is revealing in terms of relevance, personalization and loyalty marketing. 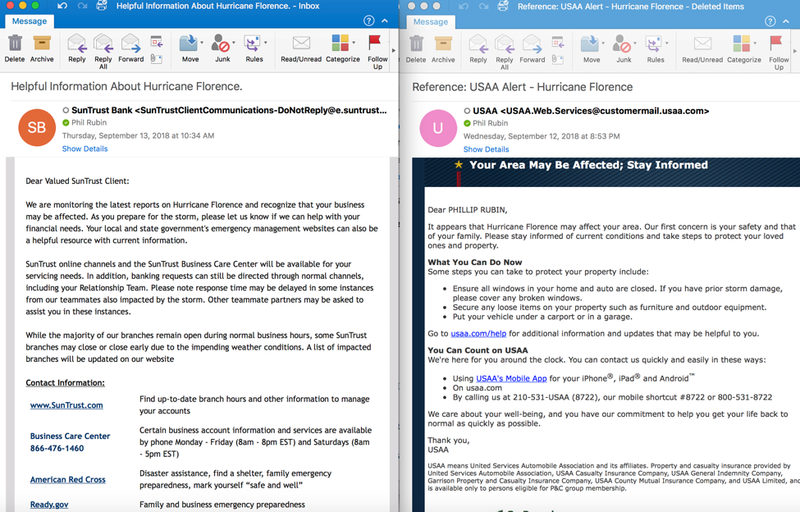 Consider these examples from two major financial institutions – both banks, among other things – with two distinct approaches to customer marketing ahead of the Hurricane Florence’s landfall. There is nothing more satisfying than doing business with a brand that in 2018 still can’t address you by name. I’ve been doing business with both USAA and SunTrust since the 1980s (remember, the most successful loyalty strategy in some cases…ahem, SunTrust...is inertia). Apparently it’s going to take longer than that for SunTrust to know me as something other than “Valued SunTrust Client”. USAA on the other hand, long a leader in customer (member) centricity, gets it. They first sent a text message and then an email. Addressed to me using my name. Whew. That was difficult, though not quite SpaceX. Recognition is one of five loyalty drivers that comprise our Loyalty 3.0 model. At its most basic, it starts with knowing a customer, at least by name. As we are well aware of the data requirements of financial services companies, shouldn’t we expect that they have customers names associated with email addresses? Is it (about) me the customer, or you the brand? The copy in each email also serves as a great illustration in customer marketing, specifically whether the customer is at the center of the piece or whether it is largely about the sender. USAA starts off with concern for my safety and wellbeing – of course they are in the insurance business but so is SunTrust – and extends the concern for my property. SunTrust wants to help with my financial needs. Nothing wrong with that but, first things first. Customer loyalty comes from a brand paying attention to customers and acting accordingly. Once there is a customer, it is as much up to the brand to be loyal to the customer as the brand might expect in return. Granted there is an extremely low bar in banking, but in the 21stCentury, when your customer database has your name and your email address linked, it shouldn’t be hard to not at least address the customer by name. There is a reason that Amazon has a $1 trillion market cap. It has to do with the customer being a priority not just for marketing, but for the business as a whole. It’s also a reason why USAA is included in the Brand Keys Loyalty Leaders 2018 list.